In a recent but recurring lament I asked why Apple shareholders are not being rewarded for the company’s growth. I pointed out that there is no fundamental reason why the company should receive such a low P/E multiple (about 18 ex-cash trailing and 10x forward while maintaining 70% earnings growth for over a year). There were many objections in the comments. Most of them dealt with recent reasons why doubts might have arisen among investors: Android hegemony or some perceived lack of competitiveness leading to margin compression or some macro hangover from the recession. In this article I argue that none of these objections hold water. My argument hinges on the fact that there is a precise date when Apple ceased being seen as an exceptionally valuable company and that date precedes any of the causes being suggested. The day of disillusionment was almost exactly three years ago: January 14th, 2008. 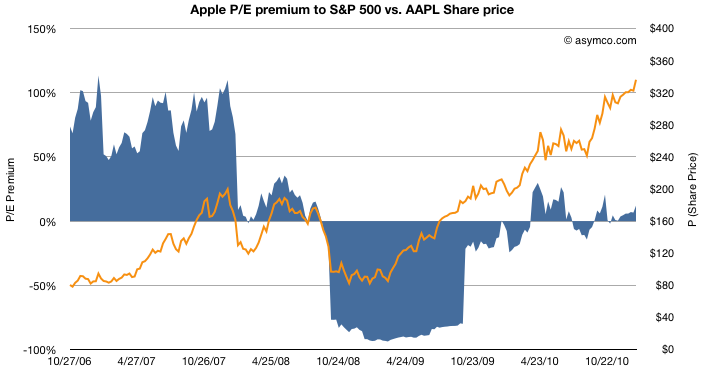 The blue area represents either a premium (above 0) or a deficit (below 0) of Apple’s P/E (ex-cash) relative to the S&P 500 P/E. This is a re-imaging of a chart, first introduced in June 2010 when I first pointed out that Apple was being discounted relative to the S&P 500. By measuring P/E I am focusing not on the stock price, which has grown nicely, but the ratio of the price relative to earnings, which hasn’t (see the next chart below). P/E is a fundamental measure of potential (its reciprocal is the stock’s earnings yield.) It is usually highly correlated to the company’s growth. If that P/E is uncorrelated to past growth, there is some significant discounting of future growth. It’s the most significant (and simplest) measure of “faith” in a company. By measuring the company’s P/E relative to an index of other large companies (S&P 500 P/E) we can assess whether the company’s potential is being valued as extraordinary or whether it’s being valued as ordinary. In other words we are measuring whether a company is “special”. The chart shows that until January 14th, 2008 the company was valued at a significant earnings premium–a P/E consistently 50% higher than the norm. Following the collapse (about 40% drop in share price but 100% drop in P/E premium), there was a small recovery followed by a huge trough in valuation. During the recession quarters Q308 to Q309 S&P earnings fell to zero or below. As a result of S&P earnings collapse the S&P P/E shot up astronomically (as E approaches zero, P/E approaches infinity). Apple’s earnings dropped as well but remained positive throughout that period bottoming at 37% growth(!) in Q408. As a consequence Apple’s P/E fell as low as 11 while the market’s went well above 100 (122.41 peak). The P/E deficit for Apple went 80%: Apple was valued as basically worthless (3x cash). After the earnings recession, the S&P P/E recovered close to historic levels but Apple’s P/E did not. 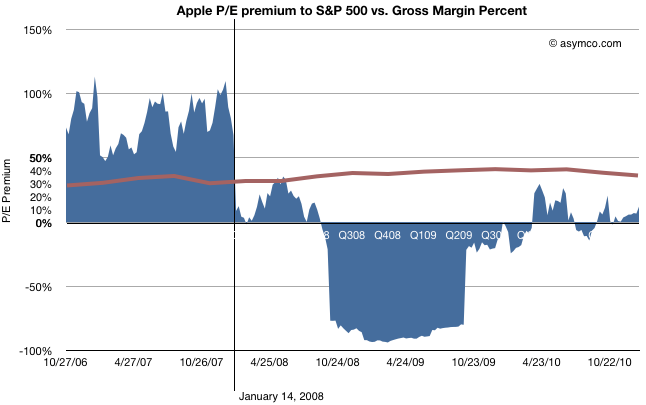 It’s in-line with the S&P but does not obtain the 50% premium preceding the recession. So we can establish that the day that Apple’s potential was discounted was nearly six months before the onset of recession. 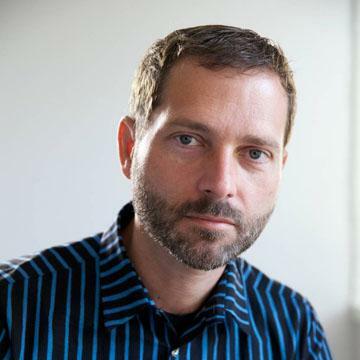 What other discounting factors can we discard? How about earnings growth itself? Did the collapse foretell an earnings collapse? The chart above shows the P/E premium vs. earnings growth (in red). Although earnings growth began to slow soon after the 14th (earnings for CQ407 were not yet announced at that point), growth recovered six months later after the launch of the iPhone 3G. Growth continued throughout 2009 and 2010 reaching new heights last year of 86%. Still, the company received no premium to the S&P 500 P/E. Companies in the index averaged, at best, a quarter of Apple’s growth in earnings. What about Android? The first Android device did not ship until October 2008 (HTC Dream or T-Mobile G1). There were no appreciable Android volumes until 2009, one year after the drop in relative value and no talk of a threat until 18 months later. The last objection to be put aside is that of margin compression. This last chart shows how margins (in brown) behaved during the same time period. They went up. The only slight decline took place during the last few quarters, after the launch of the iPad, long after the collapse. Regardless of the adjustments with product launches, Apple’s GM is the envy of the world and is not at all correlated with the loss of faith in the company. So What happened on January 14, 2008? Having led you this far in the story, I’m afraid I’m going to let you down at the end: The cause for the loss of faith is a mystery to me. There is only one noteworthy event that took place on that date: Macworld 2008 (January 14-18). During the keynote, Steve Jobs introduced the Macbook Air (and Time Capsule and Leopard and pre-announced the iPhone SDK which, six months later led to the app supernova). I remember that day and I remember that the stock began selling off exactly at the point when the Air was mentioned. It has never been the same since. Obviously, correlation is not causation. The Macbook Air need not be the cause for the loss of faith in Apple as an investment. Or can it? I’m hoping someone can explain this because to me it makes no sense. The product was not a home run but it did not do badly either and its current incarnation seems to be a hit. Whatever sins the original Air may have had have surely been expurgated by now. Regardless the cause, the bottom line is that, in the eyes of investors, Apple stopped being “special” that day. Its valuation dropped to in-line the S&P and, given its growth, well below what a large growth company should be worth. The company’s shares went into the bargain bin and are still there today. I should point out that the P/E ratio is based on post 2009 re-stated earnings. The restatement changed the P/E as the “E” changed. This was based on the abolition of subscription accounting for the iPhone. Although it may seem unfair to hold the market to this standard, restatement did not actually change cash flows which were transparent and visible to all, even to amateurs such as myself and the other unaffiliated analysts that published throughout this period. Earnings may be an opinion but cash flow is a fact. Valuation on the basis of cash flow should have yielded the same results as shown above. That quarter showed a y/y growth of 150% while the stock was in freefall. In fact, it was during that earnings day that Steve Jobs came on the conference call and pointed out the astronomic iPhone cash flow to an audience of analysts more concerned about their own jobs.